Remember this date: 11/7/05. It's key to the story of Forest City Ratner's plan to demolish six buildings in the footprint of the proposed Atlantic Yards complex. It's the date of the engineer's report to FCR that declared the buildings "an immediate threat to the preservation of life, health, and property." (The report describes sagging floors and water damage that threaten the integrity of the buildings, notwithstanding any apparent sturdiness from an outside view. Photos of the damaged interiors are contained in the report.) That means that Forest City Ratner, which announced its plan to the New York Times five weeks later, on 12/15/05 for coverage the next day, wasn't in the hugest hurry--though now the developer has nixed an independent review because it would "slow down the process." Note that the report linked above was not initially released by Forest City Ratner when the story broke, but was provided only after requests by local elected officials and Develop Don't Destroy Brooklyn. Photos below of the garage buildings at 620 and 622 Pacific Street were taken 12/18/05--it's not clear when or why windows were left open. Oddly, the Forest City Ratner press release said that 622 Pacific Street, the single-story building, was among "the six buildings which have been determined by LZA Technology to be unsafe." However, the report linked above doesn't mention 622 Pacific. Well, Forest City Ratner might say it had to get its asbestos abatement and demolition plans in place, including the identification of minority contractors, though apparently it has not yet applied for all the necessary permits. But the timing of the company's announcement deserves a closer look. FCR apparently gave the New York Times an exclusive, as it has done in the past, such as the 7/5/05 front-page article (Instant Skyline Added to Brooklyn Arena Plan) that introduced Frank Gehry's revised architectural sketches. Why give the Times an exclusive? (A Forest City Ratner press release was dated 12/16/05, the date the Times story appeared.) Perhaps because the Times's audience, including policymakers, is the key audience as the Atlantic Yards plan makes its way through review by the Empire State Development Corporation. Perhaps because the Times has more space than the tabloids. Perhaps because a general public announcement might have led to more coverage, especially in the Brooklyn Papers, as noted below. Perhaps because the Times, while certainly providing more thorough coverage in recent months, has nonetheless given Forest City Ratner the benefit of the doubt in two long articles, on changes in the plan and the developer's community strategy. The story continued to develop. On 12/19/05, a Daily News story headlined Plan to flatten 6 bldgs. ripped reported that City Council member Letitia James, along with fellow project critics state Senator Velmanette Montgomery and Representative Major Owens, would ask for a tour of the buildings with an independent engineer. 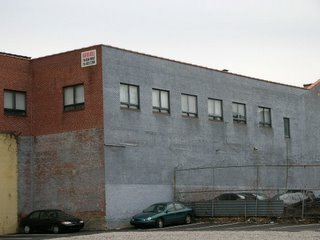 (The building below, in two photos, is at 585 Dean Street--from the outside, it looks more stable than the Underberg building further below, though the engineer's report describes interior damage in both.) The Daily News reported a complicating fact not part of the Forest City Ratner press release or the Times story: the developer signed contracts regarding the buildings at issue from March to June 2004. (The Times described the properties as "newly acquired.") 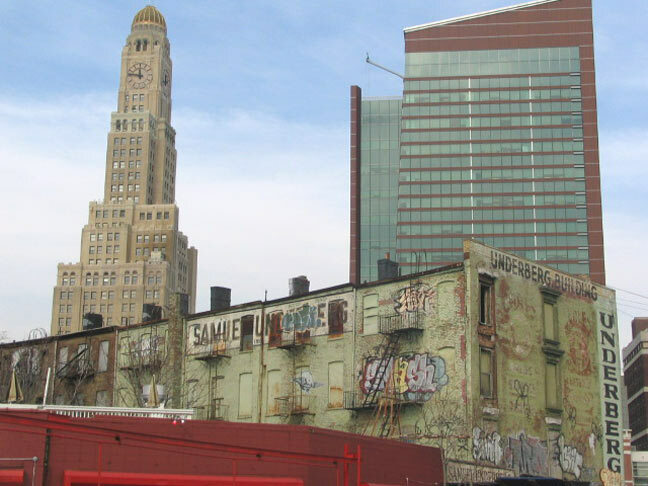 That leaves open the question of "developer's blight"--whether and how much the buildings deteriorated while under Forest City Ratner's control. The engineer's report cites water infiltration, the nature of the construction, and the age of the buildings. As Owens said in a press release issued on 12/22/05: "Ratner has owned many of these properties for over one year. 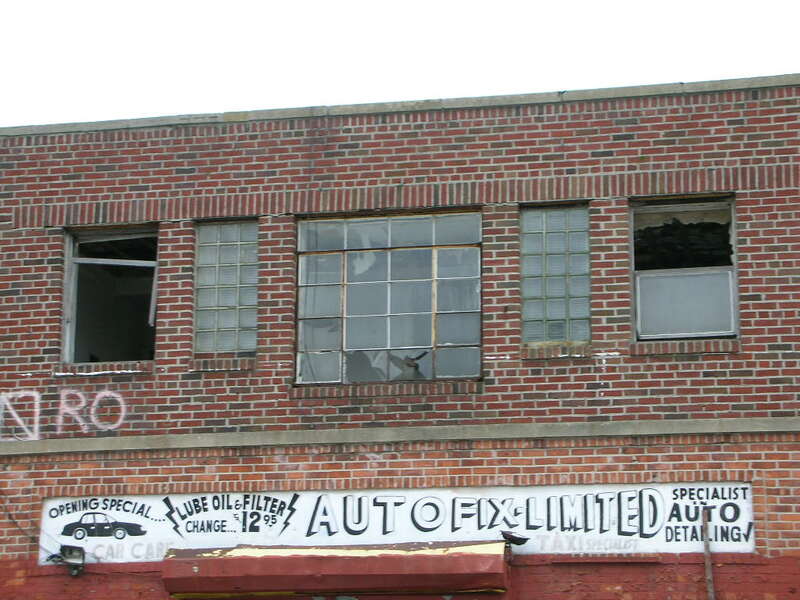 Some of the damage sustained by these buildings took place after Ratner bought them. And we all know Ratner is trying to say this is a ‘blighted’ area so he can have the state seize properties for him using eminent domain. Simply put, the area is not 'blighted.' 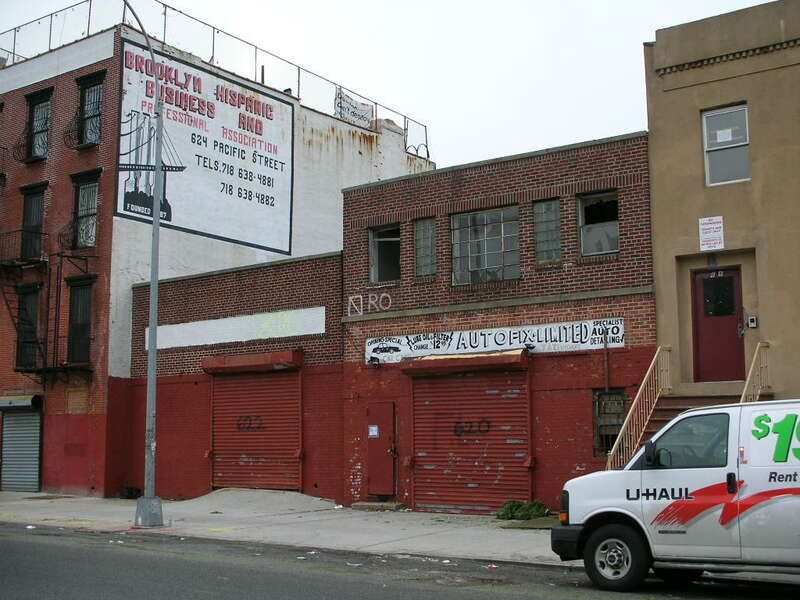 Real estate values in the footprint have risen at the same rate or faster than the rest of Brooklyn." James also offered an unsupported quote to the Daily News: "I know these buildings, and some of them are as sound as the Empire State Building." But the bigger question is: would an outside engineer reach the same conclusions as the firm hired by Forest City Ratner? 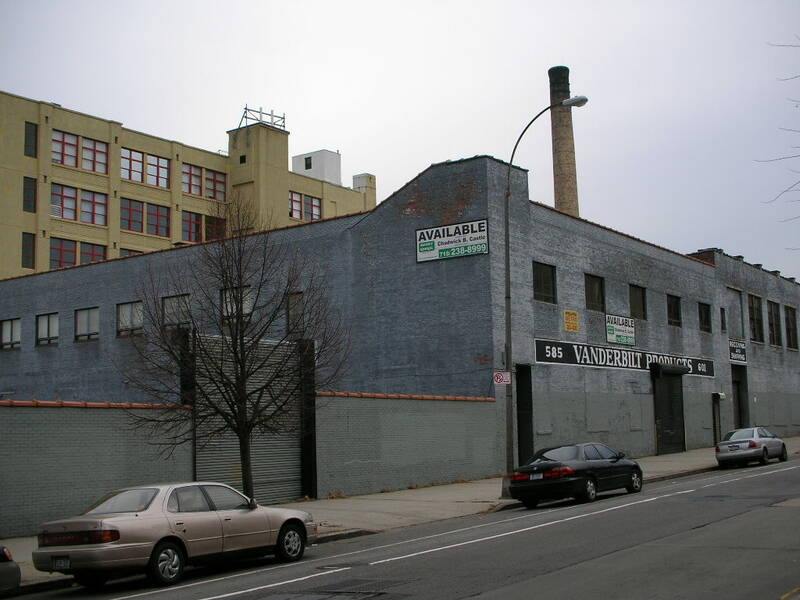 Originally, a Ratner executive approved a request from City Councilwoman Letitia James (WFP-Prospect Heights) to let her bring an independent engineer into the buildings on Dean St. and Atlantic Ave. But in a reversal yesterday, another Ratner official barred the engineer - who had agreed to do the inspection for free - and said only elected officials could take the tour. "It looks like they're trying to hide something," said James. "It looks like they're going forward with creating blight in the community." James was more cautious in her comments: James conceded the Underberg Building [above, at 608-620 Atlantic Ave., photo from Forgotten NY] should be demolished, but said claims of decay at the Dean St. buildings are "questionable." 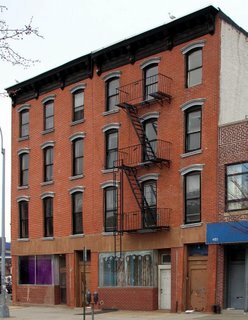 Architect Jonathan Cohn, in his Brooklyn Views blog, also raises questions about the buildings at 461 and 463 Dean Street, based on an outside view. (A photo from his 12/18/05 blog is at left.) James said of Forest City Ratner in a press release: "They told me that an independent review might 'slow down the process,'" said Council Member James. "I find this irresponsible, and overtly in contempt of the state environmental review process. We want to know what they are trying to hide by not letting us in. I have requested the Department of Buildings issue no permits until an analysis is done by someone not paid by Ratner." Left unsaid is that the five week gap between the engineer's report and the Forest City Ratner announcement could have offered more time for such an independent review. 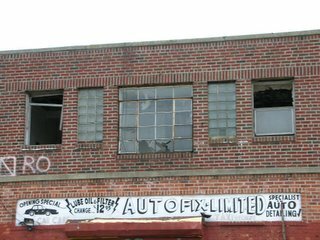 The press release apparently came too late for the article in the 12/24/05 Brooklyn Papers, headlined DEMOLITION MAN: Ratner preps Atlantic Yards site, which mentioned local officials' criticisms, but not the developer's denial of the request to have an engineer tour the buildings. The follow-up in the Courier-Life chain, headlined Ratner Itches to Level Buildings, did address the developer's denial of the request, but not the company's flip-flop. (The article is dated 12/23/05, but the issue is 12/26/05.) Rather, company spokesman Joe DePlasco criticized James for her "Empire State Building" comment, which suggested inconsistency on her part. So what's next? According to the 12/31/05 edition of the Brooklyn Papers, in an article headlined James and Ratner: 2 heads ’a’ buttin’, James said she was asking the city to refuse to issue demolition permits, but Ratner’s spokesman Joe DePlasco said "the relevant agencies" have been convinced. DePlasco muddied the waters by saying that that James and the other critical elected officials "were invited to tour the structures with the licensed engineer who wrote the reports, but they said no." This seems like an example of DePlasco's "Changing the Subject" tactic, since the independent engineer could have come along and would not have delayed the process significantly. (The 11/7/05 LZA Technology report was based significantly on a field visit just a few days earlier, on 11/1/05.) As the Brooklyn Papers reported: DePlasco also pointed out that if the buildings were to collapse and injure someone, everyone would again be screaming for the head of Bruce Ratner. Again, if the issue was public safety, why did that report wait five weeks?